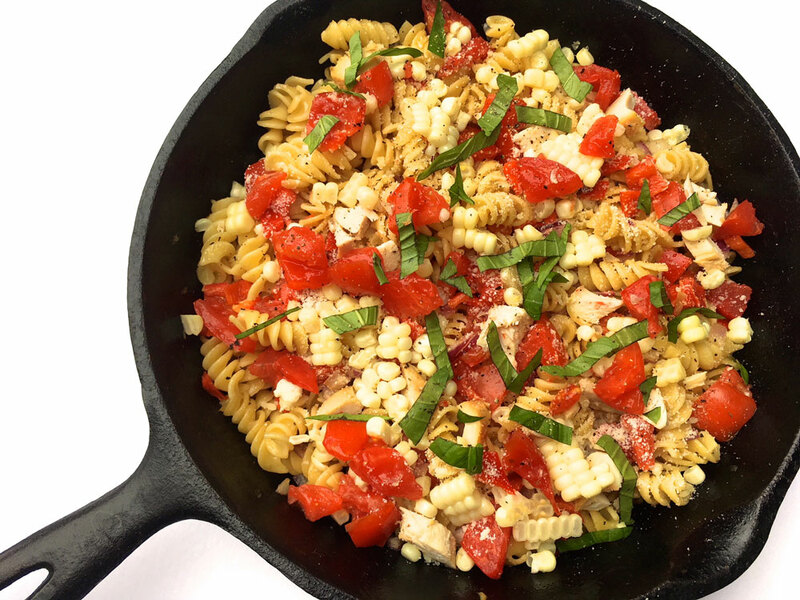 Pasta with fresh corn, chicken and vibrant vegetables makes a colorful farewell-to-summer dish. September is all about the fine line between saying goodbye to summer and looking forward to the crisp weather and new flavors that fall brings. The changeover is happening earlier this year, thanks to a hurricane bringing rain and cloudy, humid and cooler days. Suddenly running the oven or heating up the kitchen by stove-cooking doesn’t seem like a bad thing. Whether you still have one foot in summer or are eagerly awaiting fall flavors, fresh corn offers a seamless bridge. According to chef Nick Farrell of Sovana Bistro in Kennett Square, corn is a perfect ingredient for any dish. Since Sovana Bistro’s menus and decor continually change featuring ingredients locally-sourced at their peak, he should know. “You can create a silky ice cream or pair it with truffles and it will complement pretty much anything in between. Even pizza. Our “Original” Corn Pizza has had a cult following since it was introduced on the menu in 2006,” he said. Farrell is especially fond of using corn in a soup he calls Corn Veloute, saying “If I were to have guests over this time of year, this is what I would serve”. The Veloute is a silky soup thickened with corn puree instead of flour. It’s named for its velvety consistency. Chef Farrell was kind enough to share his recipe, which follows below. Whatever you decide to do with fresh corn, make sure to eat a lot before the season ends. Or better yet, grab a dozen ears now and save for later by freezing. This is so easy to do. After stripping off the husk and silks, blanch them in a bit of water in a covered pan or a microwave-safe bag. Let cool and stand on end in a bowl or on a cutting board with a towel placed underneath. Using a sharp knife, cut the succulent kernels off the cob by stripping them from top to bottom. Freeze the kernels on parchment paper in a single layer. Then you can portion out and freeze in small freezer bags to save for a rainy day. For myself, I decided to bridge the seasons by making a pasta dish using fresh corn as the key ingredient, enlivened with colorful red peppers and bolstered with chunks of chicken meat. No matter if you try Chef Farrell’s soup or my pasta dish, you’re sure to enjoy a great dinner. Sautee the garlic, onion, shallot and carrot lightly in olive oil in a deep pot for 3 minutes. Add 3 cups of corn stock, and heavy cream. Season with salt and pepper. Bring to a simmer for 10 minutes. Put into a blender and blend on high speed until soup becomes velvety. Re-season if necessary. Serve in a soup vessel with a dollop of creme fraiche and grated summer truffles for an extravagant touch. Place whole ears of corn in a ziplock freezer bag with several tablespoons of water. Close the bag leaving a 2-inch opening. Place with open end up in microwave and cook on high for 3 minutes. Remove from microwave using potholders and remove corn to a dish, setting aside. Let the corn cool slightly, then cut off the kernels. Melt 2 tablespoons butter in a large skillet over medium heat. Add onion and sauté for several minutes till softened. Add the garlic and cook briefly. Add the red peppers and cook for 3 minutes. They should remain slightly firm. Add the wine and cook until reduced by half. Bring the chicken to room temperature and cut into pieces, set aside. Meanwhile, cook the fusilli as the label directs. Reserve 1 cup of the cooking water, then drain the pasta. Add the chicken broth and corn kernels to the skillet and bring to a simmer. Add the pasta to the skillet; add the chicken, scallions, Parmesan, the remaining 3 tablespoons butter and 1/2 teaspoon salt. Toss to combine, adding the reserved cooking water as needed. Season with salt and pepper. Top with more Parmesan and basil.